DXN TSI is an annual event organized by the Company and is open to all DXN Distributors worldwide. Its fiscal period commences on the 1st of August of the current year and cuts off on the 31st of July of the following year. Regardless of how many times a distributor has transferred his/her membership from one country to another within the qualifying fiscal period, the distributor shall only be allowed to participate in the TSI of that particular country that he/she has registered provided that he/she has registered as a member for or has transferred to that particular country for a period of not less than 7 calendar months. The Qualifier who stays continuously for 6 months with the last registered country shall be allowed to participate in the TSI of that country. You could read the whole TERMS & CONDITIONS OF TRAVEL SEMINAR INCENTIVE 2014 here. 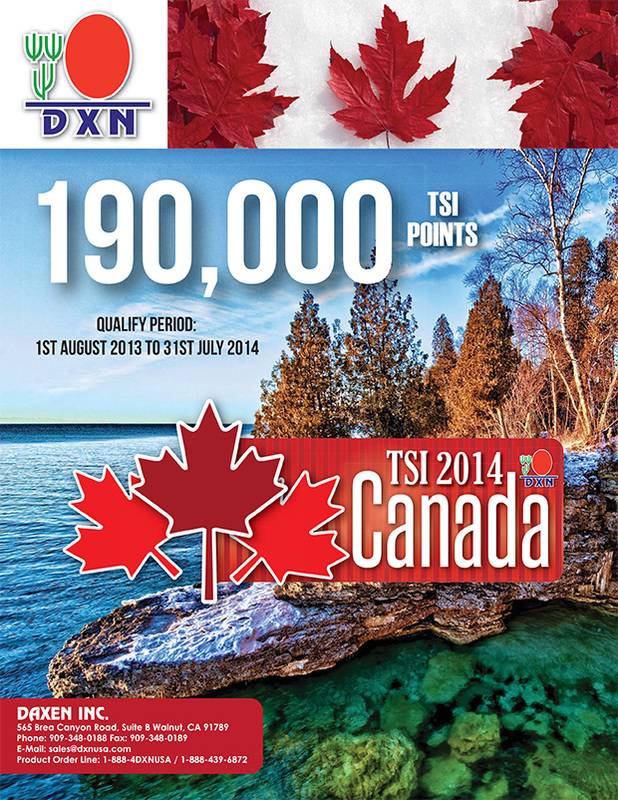 DXN TSI 2014 USA Quota Released! See you at Canada! Year 2014 TSI qualified Quota is 190,000 points accumulated through the qualified period of August 1st, 2013 to July 31st, 2014. You may keep track of your ITSI points on your monthly bonus statement.